There’s always been something majestic and mesmerizing about the sunset, that magical hour of twilight between night and day, even more so if you’re watching the sun set on our beautiful country. Life is all about following the horizon, and with today's deal Makhsoom offers you an unforgettable experience. Christmas is approaching, and the Rotaract Club of Metn, sponsored by Teleferique, Chef's Station, Sweet Corner, and Makhsoom bring you a great deal. 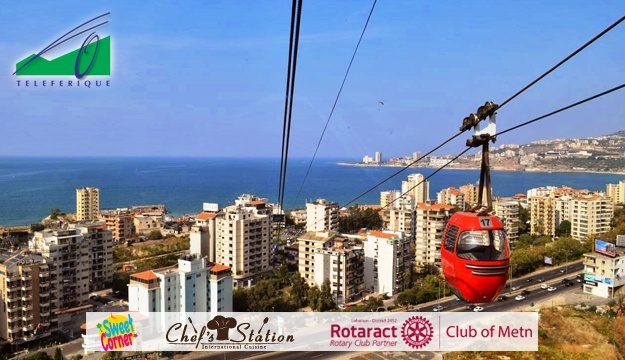 Here is your chance to save on a great full-day outing with family or friends: a roundtrip ride in the cable cars, a meal at the food court, with outdoor and indoor playgrounds available, and perhaps a visit to the Sanctuary of Our Lady of Lebanon in Harissa, while also doing your part to support a good cause. The Rotaract Club of Metn will be using these proceeds to spend Christmas with sick children in hospitals, while also bringing them gifts and entertainment. See Lebanon in a way you’ve never seen it before, a beautiful sweeping landscape that takes in city, sea, and sky all at once! Share a special moment, with friends or family and forge a memory that will last forever. While the view may definitely feed the soul, it most unfortunately skips the stomach. Once you've reached the top, you can head on over to the food court for a bite to eat! With all that going for you, take advantage of this deal and share an experience that you’ll remember for years to come! Your tour can begin from either the Maameltein area of the city, 16 km from Beirut, or from the sanctuary atop the pine-forested slopes of the Harissa mountain where Our Lady of Lebanon is towering high above the Mediterranean bay of Jounieh. A gentle glide up will slowly reveal spectacular vantage points of the city, the sea and surrounding landscape. As you soar to nearly 650 meters above sea level, the exhilarating nine-minute excursion is quickly replaced by an exploration of your taste buds, as you sample delectable delights from your choice of restaurants and cafes. A short trip on the Funicular will take you for the remaining distance to the Statue and adjacent Basilica before your final descent from sky back to sea again. In their journeys and tours, tourists search for historical monuments and beauty. They express awe before the temple of Baalbeck, and monuments of Jbeil, Tyr, and Sidon, and are enraptured in the shadows of the Cedars. Yet, at the feet of the Lady of Lebanon in Harissa, they show reverence and worship purity and piety.